I prefer to use this baked risotto so that I’m not standing at the stove-top. Using Bob’s Red Mill pearled farro helps create a creamy base that only gets better once you add the cheddar cheese. Make sure you’re using a good sharp cheddar. The saltiness from the sharp cheese balances the warmth from the farro. Vegan: take a play from a recipe from The First Mess’ cookbook and use a bean puree in place of the cheese. 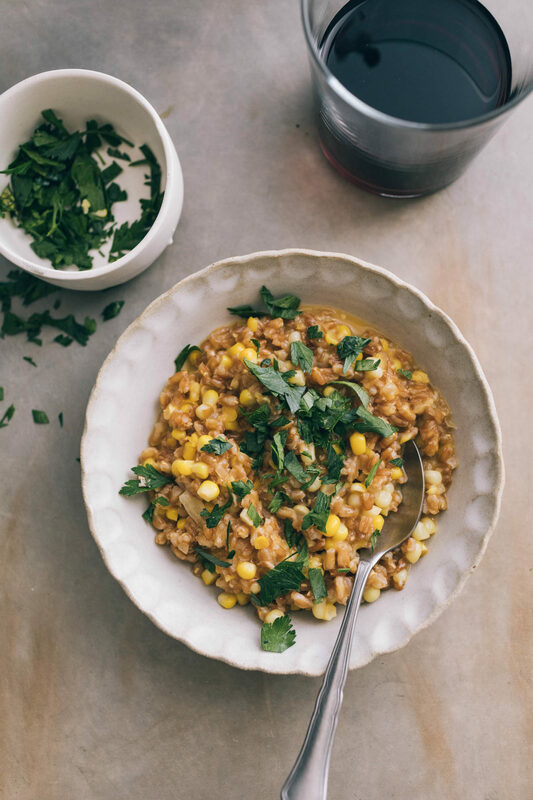 Grains: Swap out the farro for pearled barley or spelt (if you can find it). If you would like to keep this gluten-free, use the traditional arborio rice (or short grain brown rice- a favorite of mine). Herbs: This recipe is really great with herbs and I’ve also mixed in a swirl of pesto at the end. 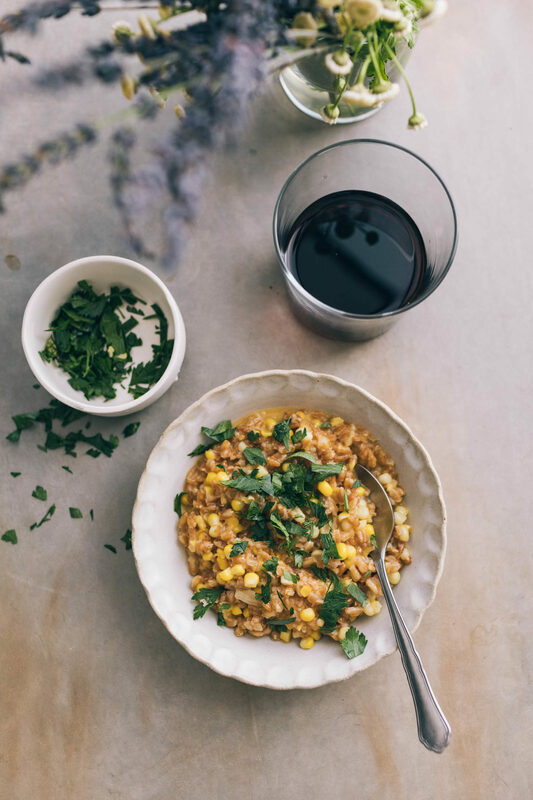 This sweet corn farro risotto is also nice with alternative pestos. Farro is one grain that tends to stay in whole-form in my cooking. The slightly warm and nutty wheat berry is perfect for salads, stews, and bakes. It keeps a slight chewy texture but soaks up flavors of everything around it. You can also crack farro- I use this technique for whole grain morning porridges or making a farro risotto. Cracking adds a bit of extra creaminess without any additional ingredients! To get started, mince your onion. Heat a 3 or 4 qt dutch oven and add a drizzle of olive oil. Add in the onions and a solid pinch of salt. Cook until the onions are really soft, 10 or so minutes. While the onions are cooking, prep the corn by removing the silk and the kernels from the corn. Add the corn to the onions and continue to cook for about 5 minutes. Measure in the farro and cook for a couple more minutes, to help the farro toast. Stir in the white wine and let cook until the wine is mostly gone. After the wine, measure in the broth. Bring the pot to a simmer then remove from the heat, cover, and place in an oven that has been heated to 375˚F. Cook for 35 to 40 minutes, after which time, most to all the liquid should be absorbed. Once the farro is tender and 95% or so of the liquid is absorbed, remove from the oven and stir in the cheese. Taste and add more salt if needed. If there isn’t a ton of liquid left and the risotto feels too thick, add a splash or two of half/half, milk, or more vegetable broth. 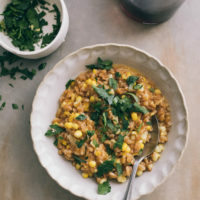 Tips + Tricks: if you’re not using pearled farro, you will need to cook this for 10 to 20 minutes more and possibly add more liquid. Start checking the dish around the 40 minute mark and add more water as needed. This looks amazing! 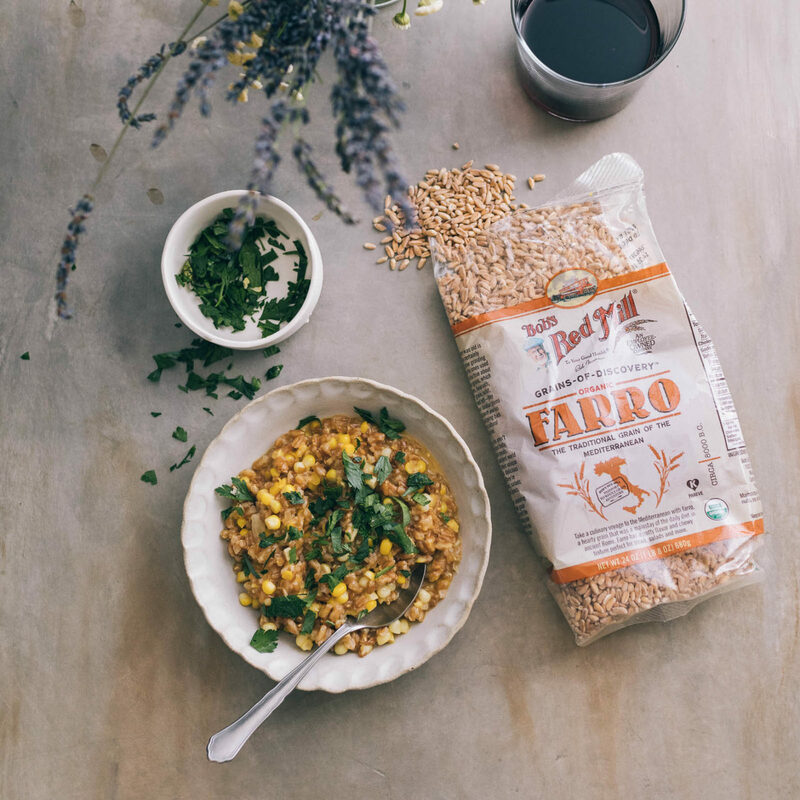 Have you or any readers tried with Trader Joe’s 10 min farro? Thanks! I haven’t- you could try it and work with the liquid ratio on the package. Maybe- the texture of the grain would change but I think it might still be good. This recipe is wonderful. I added bacon and doubled the recipe—makes for great leftovers!